The prospects of an extension to Saudi Arabia’s King Abdullah Scholarship Program (KASP) were much on the mind of attendees at the recent ICEF Dubai Workshop. In the weeks following the workshop, official sources have indeed confirmed that KASP has been extended through 2020. This report provides additional details on the extension below as well as an update on current market conditions in Saudi Arabia. Dr. Saad Nasser Aldwayan is an International Cooperation Consultant at the Ministry of Higher Education in Saudi Arabia. 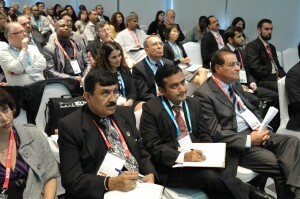 His session given on the opening day of the recent ICEF Dubai Workshop provided a packed room of attendees with an overview of the education system in Saudi Arabia as well as the trends and preferences of Saudi students wishing to study abroad. As Dr. Aldwayan pointed out, with 79 percent of the Saudi population under the age of 40, and 36 percent of the population younger than 15 years of age, the growth potential in Saudi Arabia is far too great to ignore. Currently, 1.15 million students are enroled in higher education, with 5% in private institutions. Females make up 60 percent of the student population. Since their attendance at the workshop, Eden has confirmed that they have their first group of Saudi students starting their English courses imminently. The KASP came into the spotlight recently due to murmurings that it had been extended until 2020. The programme began in 2005 and was given a five year time limit. In 2007, King Abdullah extended the programme for another 2 years and in 2009 a further 3 year extension was granted. There was much speculation over whether or not an additional extension was in the pipeline, and much to everyone’s delight, official sources have confirmed that it will run until 2020. The Saudi government invests a hefty 9 billion SAR (approximately 1.782 billion EUR) in the programme each year, and this provides full funding for 125,000 students – for both undergraduate and graduate programmes abroad. At present, the undergraduate fields of study are limited to medicine, medical science and health sciences; however, more options exist for graduate studies. The Ministry of Higher Education website details which countries currently qualify to receive students. The Saudi government turned to these countries to learn valuable lessons when developing their own education system, namely the US, Australia, Malaysia, South Korea and Finland. This entry was posted in Agents, Middle East, Most Popular, Regions, Saudi Arabia, UAE and tagged KASP, STEM degree, student recruitment, Most Popular, international students. Thanks for your comment. Please note that the KASP is available to Saudi citizens. If you are looking for scholarships or financial aid, we suggest you contact your school and search on the web and in social media channels for more information. I want to know if this scholarship program can be made available to the non saudis residing in Saudi Arabia? KASP is only available for Saudi citizens residing in Saudi Arabia. Please note that ICEF Monitor is a news and market intelligence site for industry professionals. Moreover, ICEF is not an agency; instead we help connect quality agents with schools all over the world.